The installation of state office bearers of IVA Kerala and the inaguration of activies of the year 2019 was organised on 23.01.2019 at Kerala Science and Technology Museum, Thiruvananthapuram. A state level seminar on the topic of "Responsible farming and livestock products manufacturing practies for sustainable community health" was conducted along the program. Prof. C. Raveendranath, Hon. Minister for Education, Govt. of Kerala Inaugurated the seminar and the function was presided by Dr. B. Bahuleyan, President, IVA Kerala The activites of the year 2019 was inaugurated by Shri. V. Sasi, Deputy Speaker, Kerala Legislative Assembly. Dr. Robin J Paul, Dr. Jalaluddin C., and Dr. V.N. Vasudevan handled the different sessions, and Dr. J. Abraham served as the moderator. Dr. P.K. Sadanandan, Director of Animal Husbandry, Dr. V.M. Harris, President, Kerala State Veterinary Council, Dr. Jose James, Managing Director, KLD Board, Dr. Vinod John, Managing Director, Kepco, Dr. Bijulal, Managing Director, MPI, Dr. K.R. Arunkumar, President KGVOA, Dr. V.K.P. Mohankumar, President, KVSA delivered felicitations. 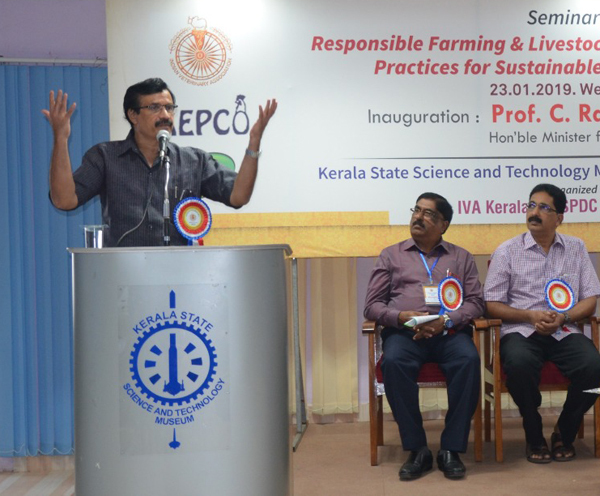 Dr. Rajesh Kumar S., General Secretary, Dr. Muhammad Aslam, Treasurer, Dr. Shibu Panadala, Vice President and Dr. Manju P.M., Vice President of IVA Kerala spoke during different sessions. Around 250 Veterinarians ranging from retired vets to research students attended the function. After the program, first state committee meeting of the association for the year 2019 was conducted.